I teach kindergartners, a wonderful opportunity to help kids hear, know, and begin to do what the Bible says. But the time I spend with kids is minimal in light of their entire week. I may be able to introduce or reinforce biblical truths and spiritual growth, but I recognize that parents are the primary spiritual teachers of their children. When the Bible is taught and lived out at home, a child’s life is greatly impacted by its truths. And, if we can connect teaching at home and teaching at church, the impact is multiplied. Encourage parents to sign up for KISS Connection. Or sign up yourself and forward the message to your parents. View the archive and sign up on the Parent2Parent community. If your church uses other resources for Sunday School, look for ways to help parents connect with their kids. Offer questions that parents can ask. Suggest ways for parents to talk about biblical truths during times that families are together–in the car, at meal time, before bedtime. Deuteronomy 6:6-7 commands parents to teach spiritual things to their children. 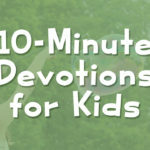 How can you help them through your kids ministry? Ministering to Kids with a Sick Parent.